Hand & Lock Class Winner! Good morning, and a happy Monday all around! This morning, just a quick announcement of the winner of the Hand & Lock embroidery class, from the generous class give-away offered by Hand & Lock here on Needle ‘n Thread, with a little more information about the classes available and the venue in Williamsburg. 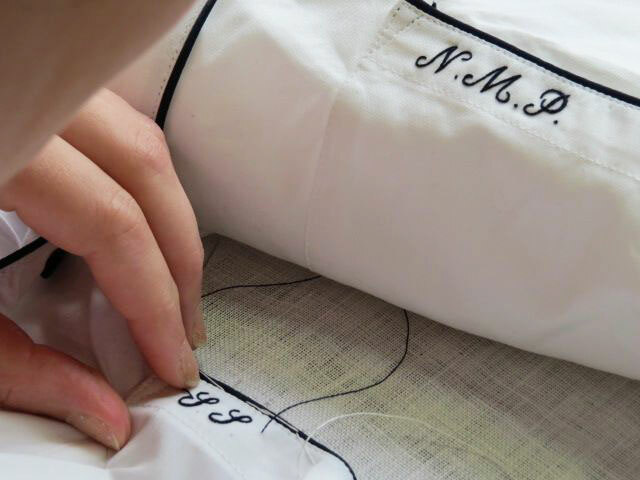 Over on the new (just launched last week) Williamsburg School of Needlework website, you can read all about the embroidery classes offered there, including the Hand & Lock classes that are taking place in September, 2015. The Hand & Lock class winner was drawn randomly by number, using a random number generator. All of these classes sound like a chance of a lifetime. I would choose the monogramming class, as I would very much enjoy learning the basics in the proper way from master teachers! And what a delight to have this in Williamsburg. Congratulations, Robin! Please drop me a line with your contact information, and we’ll go from there! Lots of fun stuff going on in the background here in Kansas! I had a few more adventures (and a big failure) with fabric printing last week, I’ve set up the book cover project, and this week, I do believe my workroom is getting a big overhaul. What must be done, must be done! If the weather holds out, that’ll happen tomorrow. I’ll take some before and after photos – just keep your fingers crossed for me, that I actually arrive at “After”!!! Other than that, the hummingbirds are moving along, the stitch sampler alphabet book is 26 more pages towards completion after this weekend, and – joy of joys – my taxes are done. Tomorrow, I’ll share some newsy bits with you – several delectable things going on out there in the needlework world in the last week, along with a beautiful free project to download, a good cause, and some perfectly inspiring instruction! See you then! March 23, 2015 Hand & Lock, Tambour Beading, Monograms, & Free Tuition! Good Morning Mary! I can’t wait to see the workroom overhaul, I’m planning a completely new sewing space, and I can use the ideas. My taxes are finished also, and I’ll write those huge checks tomorrow. 🙂 Ahhhh…. Well, it’s an “overhaul” insofar as I’ll be cleaning up and re-organizing some things, but it’s not a whole new arrangement. I just need to remove some furnishings and move some stuff out and other stuff in. It won’t be one of those fancy-schmancy studio re-dos, I’m afraid! Congratulations, Robin! Hope you enjoy learning monogramming, and have a safe trip to Williamsburg! Cleaning out the ol’ workroom again, eh, Mrs. Corbet? Why does stuff have a way of accumulating on our surfaces?! And Robyn, oh goodness, how excited you must be. A hearty congratulations and all the very best with every aspect of the course. And the best to you Mary for the weeks projects. Missed this post yesterday. Congratulations to Robin I do hope you enjoy the monogram course sounds so exciting. Good luck Mary with the overhaul of your workroom. I hope the stitch sampler alphabet book will be finished soon, can’t wait. Good to year the Hummingbirds are moving along and I look forward to your adventures with printing on fabric. Thank you, all! I have just seen this after an intense several days at work and now I’m bouncing off the walls. I am so delighted I don’t think I will sleep tonight! I have so many books about historical needlework, drooled at the V&A textile room, visited the Royal School of Needlework shop in Hampton Court, yet I never felt like I would ever be able to master the basics enough to call myself an embroiderer, like my grandmother was. Thank you for hosting this contest. I will have to let you all know how it goes!